Given the detailed description of the event, I don’t think this was a gathering of mere Luddites. I’m glad to see The Chronicle publish this report, given that it also came out this week with a special supplement on “digital learning” that was mostly complementary. Technology is full of wonder, but what are its implications not only for academic freedom, but more importantly for learning. Companies, colleges, and columnists gush about the utopian possibilities of technology. But digital life has a bleaker side, too. Over the weekend, a cross-disciplinary group of scholars convened here to focus attention on the lesser-noticed consequences of innovation. After a week of faculty backlash against online education, including the refusal of San Jose State University professors to teach a Harvard philosophy course offered via edX, the down sides of digital learning emerged as a hot topic, too. via Scholars Sound the Alert From the ‘Dark Side’ of Tech Innovation – Technology – The Chronicle of Higher Education. I’ve just been reading a thread on an academic listserv about Coursera. This led me to the following post by Clay Shirky about massively open online courses or MOOCs. Can you get your University education for free? Will services like Udacity and Coursera change higher education the way Napster changed music? 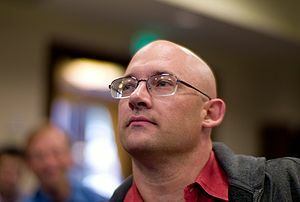 via » Napster, Udacity, and the Academy Clay Shirky. That’s good advice this time of year. This week’s roundup of new and updated apps features new ways to achieve a Zen-like state. via The Week in iOS Apps: Keep calm! | Macworld. If you are reading this, you probably have broadband. But what is broadband? How can we close the “digital divide” between urban and rural areas when internet access is becoming a utility like any other? This past spring, we aired a story about the gap between the United States and Europe when it comes to broadband access. Recently, Pioneer Public TV in Appleton, Minn., looked at a broadband divide closer to home by exploring the gap between broadband access in rural areas compared to urban areas within the United States. While many Internet providers claim to give “broadband” access, the loosely defined term has left many Americans wondering if they’re receiving the best service. Specifically in rural communities, like those in midwestern Minnesota, companies providing “high-speed” Internet may only be granting users a moderately fast download speed, while upload speeds are severely lagging. Pioneer Public TV takes a look at the situation by exploring the stories of people who are lacking fast, reliable Internet access; companies that are struggling to keep up with the demand of supplying high-speed fiber connections in rural communities; and how our representatives in Washington, D.C. are handling the problem. via Bringing broadband to rural America | Need to Know | PBS. Watch Rural Broadband Special on PBS. See more from Pioneer PTV Specials. Time is money, and knowledge is power. What is the impact of your service’s transfer rates? Some say fashion is pain, and in the case of Dave Hurban, it actually is. Hurban recently implanted magnets in his wrist himself — all for the ability to wear his trusty iPod Nano like a watch without having to sport a wristband. What motivated him to do it? “I just thought it would be cool,” Hurban said in an interview with Digital Trends. To turn himself into a human iPod dock, Hurban had to make four incisions on his wrist, where he inserted small magnets. After a little bit of blood and some healing, the magnets, for all intents and purposes, are now a permanent part of his wrist. Hurban calls this creation iDermal. The magnets are placed specifically to hold on to the four corners of the Nano. When he wants to wear his iPod Nano as a watch, all he has to do is hold the player close to his wrist and the magnets grab hold of the player and attach it to his body. via This Guy Gave Himself Implants for His iPod Nano. The video is not for the faint of heart. This is only latest example of personal augmentation, of people modifying their bodies to incorporate technology. As such it is anticipated by cyberpunk, as in the works of William Gibson and Bruce Sterling. What do you think of this? Some of my students are becoming aware of my penchant for using QR codes on handouts and in presentations to direct them to web resources. But it gives me pause that they are not widely adopted in the US. I heard this report yesterday, too. Give a listen and weigh in on this technology. Would you use or not? Why? If you drive by billboards or flip through magazines from time to time, you may have noticed pixelated squares popping up all over the place. These aren’t scrambled checkerboards or alien landing pads, but QR codes, short for quick response codes. The codes are scanned with a smartphone camera, kind of like one might scan a bar code, and marketing departments all over the country are coming up with clever ways to use them. What did you do on your summer vacation? Did you go to places like the dunes and mudflats with “earphones in and handheld electronic devices on and open”? Please follow the link to the whole post, read it, and reply with your experience and your view.